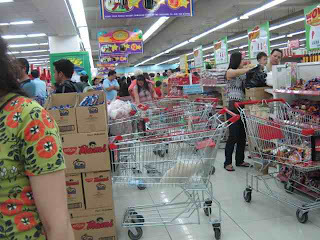 Panic Buying After Typhoon Ondoy | To Be, To Be. Tutubi. This was the scene that greeted me when I went down from the office to buy some groceries at the nearby Robinsons Supermarket in Ortigas. 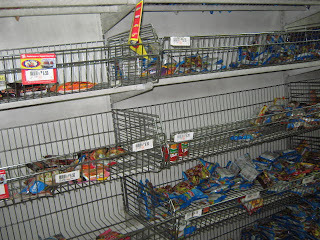 Shelves of canned goods and instant noodles are almost empty, and the lines at the cashier were very long. It seems everybody are all in a panic buying mode having heard that another typhoon is on its way. A while ago, my mother went to the palengke and she texted me that the pillows that used to be sold at 3 pieces for 100 pesos are now priced at 80 pesos each. I told her not to buy anymore, since we have slept with no pillows for 3 days now, then we should be okay for a few more days when prices have already stabilized. Even clothes hanger that used to be 35 pesos per dozen are now being sold at 55 pesos. It seems that some people really are so insensitive to the sad plight of others, and are all for profit even at this time! Thankfully, food prices are still the same, as my mother reported. yeah, and those people who charge for taking a ride in their bankas. Farmville is Bad For Me! Is my Husband a Hypochondriac? Halloween Party? Count Me In!